Onions, carrots, celery, walnuts - whatever you like on your salad or whatever you have around the house! Directions- Make two large salads. Make Guacamole by combining all ingredients in a container w/ a tight fitting lid. Chill in refrigerator while you make the Quesadillas. Spray a skillet with cooking oil. Cook onions and peppers on a medium-high heat until soft and aromatic. Lower heat to medium-low add shredded chicken to skillet. Sprinkle seasonings to coat chicken and veggies. Cook until chicken is re-heated. Spray cookie sheet lightly with oil. Place two tortillas on sheet. Layer with chicken/veggie mixture and cheese. Top with remaining tortilla. Bake in oven 8-12 minutes until cheese is melted. Cut into wedges with pizza cutter. Serve with Guacamole. This was the first time I'd ever purchase a rotisserie chicken. I needed something quick and healthy for dinner and figured I would use the rest of the chicken somehow. I was truly happy with all three meals and none of them took more that 30 minutes to make. 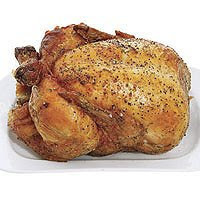 Please post in the comments your favorite rotisserie chicken dishes. Our first meal from a rotisserie chicken is usually a spinach salad, whole wheat toast, and pieces of the chicken. Or, sometimes, instead of toast, we'll make stuffing (the kind where you boil the water, add the stuffing mix, take it off the burner and let it stand for 5 minutes). Our second meal is usually chicken salad sandwiches or the chicken plus some pasta and broccoli. Third meal, if we have any left, is sandwiches or pieces picked off the carcass and added to a salad.